Botgirl's Digital Playground: ATTENTION HUMANS: Morbo demands you read this guest post immediately! ATTENTION HUMANS: Morbo demands you read this guest post immediately! 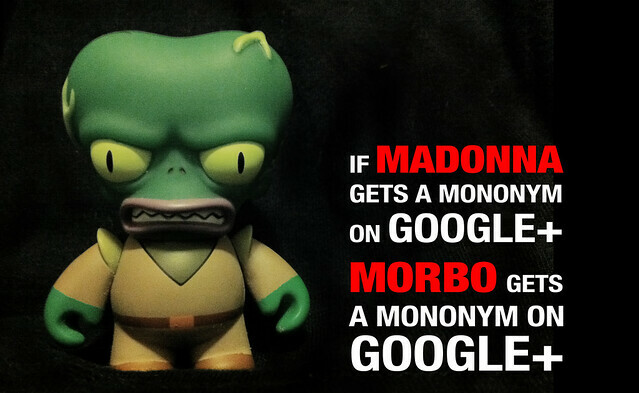 Morbo has stooped to appearing on this pathetic blog to send an important message to you. Especially the one called Eric E. Schmidt and his whiny little sidekick Vivek (Vic) Gundotra. As you know, all humans are vermin in the eyes of Morbo and one day my race will destroy you all! But the leaders of your technologically primitive organization have offended Morbo in an especially vile way. You are even more repugnant to Morbo than the carrion eating fungus leeches of Alpha Ceti Thirteen. You have made the fatal mistake of granting special mononym privileges to the red-mouthed succubus Madonna, while denying Morbo the same courtesy. Despite Morbo's deep male voice and huge, throbbing forehead veins, you have failed to recognize Morbo's enormous celebrity status. You have dared to give Morbo four days warning of profile suspension. I would devour you and your entire Board of Directors immediately, but corporate executives give Morbo gas. And I hate picking the tiny bones of emaciated geeks from between my sharp carnivorous teeth. Nevertheless you has moved up to the top of Morbo's "to destroy" list. You have been warned. The outcome is now in your weak and puny hands.